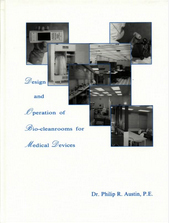 Encyclopedia of Cleanrooms, Bio-Cleanrooms, and Aseptic Areas By Dr. Philip R. Austin, P.E. $349.00, 1000 pages, 38 Chapters, 1600 color photographs, illustrations, etc. This encompassing reference covers every aspect of cleanroom and bio-cleanroom systems and technology. Never before has so much contamination control information been assembled in one textbook. Every type of clean facility is discussed in terms of design, construction, operation, procedures, and management. This 6th book by Dr. Austin is unbelievable in the amount of information provided. There are no other textbooks in this field are so complete. Thousands of Vital Facts and Figures. By Dr. Philip R. Austin, P.E. $199.00, 460 pages, 14 Chapters, 540 color photographs, illustrations, charts, etc. 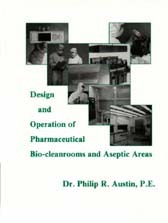 This encompassing reference book covers every aspect of pharmaceutical bio-cleanrooms, aseptic areas, sterile areas, their systems and technology. Never before has so much pharmaceutical contamination control information been assembled in one textbook. Every type of clean facility is discussed in terms of design, construction, operation, and management. This 5th book by Dr. Austin is unbelievable in the amount of information provided. It is the textbook of prominence in the pharmaceutical field. $199.00, 440 pages, 14 Chapters, 500 color photographs, illustrations, charts, etc. This encompassing reference covers every aspect of bio-cleanroom systems and technology. 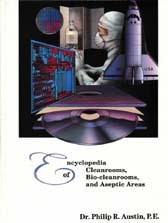 Never before has so much bio-tech contamination control information been assembled in one textbook. Every type of cleanroom facility is discussed in terms of design, construction, operation, procedures, standards, and management. This 4th textbook by Dr. Austin is unbelievable in the amount of information provided and one of the books of the decade in the medical device field.